Your network can go off the air when ice, snow and rain degrade signal levels. Walton De-Ice products help protect your signals from Ice, Snow, and Rain Losses. Protect your Ka Band antenna from Snow, Ice, Rain and the Sun. One cover does it all! With a PTFE Snow Shield Cover, you will have the protection of the Ice Quake System which will also activate during a rain storm to keep water from sheeting on the reflective surface of the antenna. The Solar Cover system can also be added to keep the temperature within the cavity the same as the outside temperature to help reduce the movement of the reflective surface during day light hours. All three systems can be individually purchased or can be purchased all in one inclusive package to meet your environmental requirements. 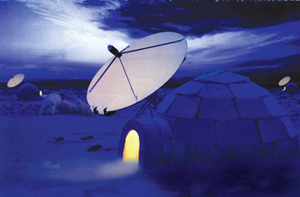 Our Snow Shield cover is designed for antennas from 0.6 to 6.3 meters in diameter. The Snow Shield consists of PTFE coated material, which is virtually invisible to RF, stretched over the satellite antenna. The Snow Shield can be used as a passive, Ice Quake, or heat system that can be added for a higher level of protection. The Ice Quake system (U.S. patent pending) enhances the reliability of the Snow Shield systems by a factor of 100 percent. The Ice Quake System also acts as a Rain Shield to prevent water from sheeting on the antenna reflective surface causing rain fade on a Ku or Ka band antenna. Solar Cover helps reduce the movement of the reflective surface during day light hours.